What is DHCP, how does it work? What are the Best DDI/IPAM Systems? The Dynamic Host Configuration Protocol (DHCP) allocates IP addresses to devices connected to a network. It centralizes ownership of addresses so that no individual piece of equipment on a network has a permanent address. DHCP is part of the TCP/IP protocol suite and is regarded as an application layer protocol in the TCP/IP stack. The protocol allows network managers to assign addresses to network-connected devices. The address format that the system uses is the IP address, which is defined in the Internet Protocol — another part of the TCP/IP protocol suite. DHCP is routinely used by internet service providers to assign IP addresses to customers. This system enables ISPs to make more efficient use of a pool of addresses. Not all of an ISP’s customers are connected to the internet at the same time, so residential users no longer get assigned permanent addresses. Instead, each is allocated an address for the duration of the connection. Private wifi routers implement the same method for the networks that they operate on. IP addresses have to be unique within the network that they access. So, on a private network, IP addresses do not have to be unique throughout the world, just on that network. IP addresses that are connected to the internet cannot be duplicated anywhere on the internet. DHCP is concerned with allocating IP addresses from a reserved pool. DHCP doesn’t track IP address usage — that responsibility is the remit of IP address management (IPAM) systems, which you will read about later in this guide. The protocol lays out procedures for the request and distribution of IP addresses on a network. Those definitions include a series of message types that the allocation process must include. Like all of the other protocols maintained by the IETF, DHCP is not a program. It is just a set of standards that anyone wanting to create a program for the DHCP address distribution function should follow. The importance of public standards for networking is that they ensure compatibility between networking programs no matter where in the world they were written. A key element of the DHCP method is the procedure that the client initially uses in order to communicate with other devices on a network. As all computers on a network need a unique address in order to communicate, the question of how any computer can communicate in order to acquire an address is a conundrum that DHCP solves. The DHCP methodology is defined in a document that is available to all and maintained by the Internet Engineering Taskforce. The IETF presents the current status of the protocol on its website as RFC 3942. This document defines DHCP version 4. The original definition of the system is held in two documents: RFC 2131 and RFC 2132. There is a collection of supplementary protocol definitions that add to the standard published in RFC 3942. For example, RFC 4242 explains how to adapt the protocol to use IPv6 addresses. There are two basic elements of a DHCP system. These are a DHCP server and a DHCP client. The DHCP client is resident on each of the devices that you have connected to your network. When that device gets turned on, the DHCP client starts its job as part of the startup procedures of the operating system. The device has no IP address and so cannot send out any messages with a return address on it. Instead, the client includes its MAC address in the message. The MAC address is actually the identifier of that devices’ network card. The MAC address of each network card in the world is unique. Here’s how these four messages, collectively abbreviated as DORA, implement the DHCP process. DHCP uses the connectionless User Data Protocol for its transmission. The request that the client sends out is called a Discovery message. In the protocol, this message type is called DHCPDISCOVER. UDP is a connectionless system, so there is no initial session establishment phase. This first Discovery message is broadcast over the network by the client. That means that it isn’t sent to a specific address. This is because, at this point, the DHCP client doesn’t know the address of the DHCP server. Although it should be possible to set up each client with the address of the network DHCP server written into the configuration, the assumption of no address knowledge makes DHCP easier to set up and to manage. If you don’t have to give the client the DHCP server address manually when you add a device to the network, the discovery operation becomes a universal procedure. Any device can have a DHCP client loaded onto it as part of its firmware and it will automatically fit into any network that it is added to. The absence of a fixed destination address also means that you can move the DHCP server from one computer on the network to another without having to go to every device on the network and reset the address of that server. There is one fixed parameter used for communications between DHCP clients and servers: the port number. The UDP port number 67 is reserved for DHCP servers and UDP port 68 is reserved for DHCP clients. This way, broadcasting a Discovery message doesn’t tie up the processors of the other devices on the network. This is because only the DHCP server’s routines will be listening on the network for messages addressed to port 67. All the other devices on the network simply ignore the message because it is not sent to port 68. The reply sent back by a DHCP server is structured as a DHCPOFFER. This message is broadcast over the network, so every computer on the system will get hold of it. This is addressed to UDP port 68, so the DHCP client on every network device will pick it up. The MAC address of the intended recipient is contained within the message, so all of the other devices on the network will simply drop the message once they see that it is not for them. The message contains a proposed IP address for the client. It also includes a duration in seconds that the device can use that address for. The allocation of IP addresses in the DHCP system is temporary, and it is referred to as a “lease.” The duration is the lease time, or how long the client will keep that IP address. Other information in the Offer message includes the subnet mask to be used for the network, the address of the DHCP server, the address of the router, and the addresses of the DNS servers on the network. With these addresses, the DHCP client can configure the networking software on the device and get that piece of equipment fully integrated into the network. You might think that the allocation of an address to the DHCP client by the DHCP server would be the end of the process. However, the situation is a little more complicated because the protocol accounts for the possibility that there might be several DHCP servers operating on the same network. If there is more than one DHCP server on the network, the Discovery message, which is sent out to all the devices on the network, will be picked up by all of the DHCP servers. Each of them will send back an offer, so that client will receive several addresses. The client picks one of those addresses, which is usually the first it receives, and then sends back a Request message confirming its use of that address. At this point, the client has the IP address of the server that sent the chosen Offer message. However, the Request message isn’t addressed directly to that server. This is because all of the servers that sent out Offer messages need to pick up the Request message that contains the chosen IP address. The server that allocated the selected IP address gets the Request message and records that the offered address is now in use. The other servers that sent out Offers also receive that Request message, recognize that their addresses were not selected, and keep those addresses available for the next Discovery message that gets broadcast on the network. 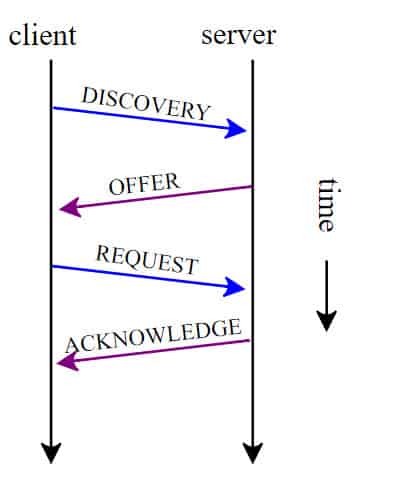 The protocol refers to the Request message structure as DHCPREQUEST. The final phase of the DHCP initialization process is a DHCP acknowledgement message sent by the server that provided the chosen IP address. This message is defined in the protocol as DHCPACK. None of the other DHCP servers on the network send back this message. Curiously, even though the client has stated its use of the offered IP address, the DHCPACK packet is not sent directly to that address, but, once again, is broadcast to all devices on the network. The DHCP client does not receive the IP address permanently. The lease time of an allocation is a matter of network policy and different lease times can be set for different types of equipment. If the lease time of an address is about to run out, the DHCP client should apply to renew it. The renewal process is exactly the same as the initial discovery process, except that this time, the client has an address with which it can communicate with the server that allocated that address. So, rather than broadcasting the Discover message, the client can contact the DHCP server directly. The client can request the same IP address, or the policy of the network may specify that each renewal should be fulfilled with a replacement IP address. Two additional message types in the DHCP definition are intended for use by the client: a DHCPINFORM message and a DHCPRELEASE option. A DHCPOFFER message consists of a number of option fields in its packet structure. However, the server rarely uses all of these and doesn’t have give values for any. A particular client program may require specific information in order to properly set up its device on the network. If that essential information is missing in the DHCP Offer message, it can send an Inform message, asking for details to be sent back. If this information is available, it will be sent by the server in the form of another Offer message, with the required option fields filled in. An example of the DHCP Inform usage is that browser frequently use this message as a way to get web proxy settings via Web Proxy Auto Discovery Procedures. In Windows Server 2003, DHCP Servers use the Inform message type to detect unauthorized DHCP servers. The Release message is sent by the client to end its lease on an IP address before the designated expiry time. This message type is not essential in the operations of the protocol because the regular ending of a lease ahead of schedule usually occurs when the user turns the device off. There are no procedures to delay the power off process to give the DHCP client the opportunity to send out a Release message. In this case, the IP address remains allocated to that client until its lease expires even though the device is not active during that period. The DHCP protocol is only concerned with the distribution of available IP addresses. It does not maintain contact with network nodes. It assumes that an IP address is in use for the duration of its lease and so it does not verify that the device allocated an IP address is still active on the network. In the case of network configuration changes, the DHCP manager makes no effort to reallocate addresses. These limitations are why DHCP is usually implemented as part of a suite of network addressing protocols, called DDI, which is explained further below. Here are more details on each of these modes of operation. This is the standard allocation method used by DHCP and follows the procedures described above. The server is set up with a range of IP addresses, known as a scope in DHCP terminology. That range may not be contiguous and so there is an option to declare exclusions within the address scope. The exclusions can also be defined as a range. In this scenario, the server retains a list of previous allocations of IP addresses to the MAC addresses of devices on the network. When a new request arrives from one of those addresses, the server will allocate the same address again. In automatic allocation, the address is not assigned exclusively to a device, and so there may be occasions when a previously-used address has already been allocated elsewhere and the server will send out a different address to that device. In this option, the DHCP server reserves an IP address so that it can only by allocated to a specific MAC address. This means that each device receives the same address each time it connects to the network. It is possible to mix manual allocation with either dynamic or automatic allocation. If a device’s MAC address is not in the reservation list, one of the other two methodologies has to be employed to allocate an address. This system is also known as static allocation, static DHCP, fixed address allocation, address reservation, DHCP reservation, IP address reservation, and MAC/IP address binding. Large networks are frequently divided up into subnetworks in order to prevent delays caused by too many devices trying to get a turn at accessing the transmission medium. In these instances, the network can still operate with just one DHCP server, but it needs a relay device on each subnet. The packet structure of all DHCP message types includes a field called GIADDR which is filled in by the relay. This is the relay’s own address, so when the message received by the relay from the client is forwarded to the DHCP server, the server knows where to send the response, and which range of addresses to use for the allocation of an address on that relay’s subnet. The relay agent’s communication with the DHCP server sees both devices using UDP port 67. DHCP uses the User Datagram Protocol. This is a connectionless communication system and so it does not include any encryption. As almost all of the message types in the protocol are designed to be broadcast to every mode on the network, snoopers could gain a lot of control over a networks operations and create devastating disruption just by getting access to the network and listening to DHCP broadcasts. This is why DHCP is rarely implemented in isolation. There are a number of coordination issues that need to be considered when allocating IP addresses. These addresses also have to be referenced by a DNS server. There is the possibility that an intruder could insert a virtual fake DNS or DHCP server into the network. The security of networks and the validity of addresses are enforced by an IP address Manager. This is a key element in the DDI solution suite. There are several issues around network addressing covered by a suite of protocols and services, of which DHCP is a part. This trio of systems is known as “DDI,” which is composed of the initial letter of each of the three methodologies. The first “D” in “DDI” stands for Domain Name System, or DNS. This protocol manages the translation between an IP address and the human-assigned meaningful names used for services on the network. The most common usage for this directory service is to translate between web domains, such as “comparitech.com” and the actual IP address of the server that hosts that site. DNS on a network gives memorable names to services, such as printers. You don’t have to worry about managing an in-house server to translate between addresses on the World Wide Web and IP addresses on the internet — your ISP will provide that service or nominate a global DNS server. Your private DNS server only needs to translate between the IP addresses issued by your DHCP server and the hostnames of the devices to which those addresses are assigned. DHCP allocates new IP addresses to nodes on a network when they are turned on. The records in the DNS table are closely linked to the activities of the DHCP server, and so the actions of both of these systems have to be coordinated. This is why DHCP is the second “D” in “DDI”. The “I” in “DDI” names the IPAM system. IPAM stands for IP Address Management. Unlike DNS and DHCP, IPAM is not defined as a protocol. It is a software package that ties together all of the IP address functions on a network, which principally includes DNS and DHCP functions. When you look for a DHCP solution for your network, you will find those functions as part of an IP address manager. So, you will need to research IPAM or DDI solutions in addition to a DHCP server. Standalone DHCP modules are rare. When you look for a DHCP solution for your network, you need to focus your search on DDI systems. It is very common for companies to refer to their DDI solutions as IPAM. 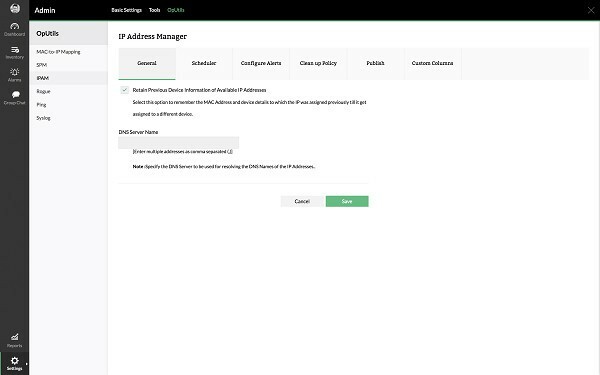 The SolarWinds IP Address Manager includes DHCP functions as well as DNS management, which makes it a full DDI system. You can mix the allocation method for IP addresses, reserving addresses for equipment and dynamically allocating addresses to terminals. The reserved address system is integrated into the DNS management console, so you can allocate addresses to services and make them available on the network simultaneously. The SolarWinds IPAM integrates with Microsoft and Cisco DHCP servers, so you don’t have to get locked into one provider when looking to add on new DHCP equipment and software. The IPAM periodically scans the DHCP servers that you have on your network for troubleshooting and scope management. The software includes a two-step wizard that enables you to set up a split scope environment, allocating ranges to subnets. The Subnet Allocation Wizard will help you to vary the size of scope reservation to suit the different sizes of the subnets on your network. The IPAM controlling software is able to define different user accounts or access to functions. This means that you can give partial access to junior team members, or reporting access to upstream managers. The system event log records every change to the IP address pool or system settings, giving the time of the change and the username of the operator who made those changes. The dashboard of the IP Manager gives real-time statistics on the address usage of the network. Standard report formats ship with the software. The system includes a Report Writer, which enables you to customize reports. Reports can be automatically distributed to a predefined list of recipients via email, or they can be set up on a web space with access controls. Solarwinds produces a number of network administration utilities. Although the IP Manager can be employed as a standalone facility, it also integrates well with other software produced by the company. BlueCat is one of the industry leaders in network software and its IPAM package is a full DDI system, covering all DHCP and DNS management functions. The system includes a handy device discovery methodology that helps you manage the addition of network nodes centrally. Another useful feature of this IP address management system is that it is dual stack. With dual stack capabilities you can run both IPv4 and IPv6 addresses on your network, enabling crossover to the new addressing system. The BlueCat DDI suite is a Windows-based system and it is able to interact with Windows DHCP servers. Unfortunately, it doesn’t have Cisco DHCP monitoring capabilities. The management system includes workflows and an approval hierarchy. This enables a team with various skill sets and capabilities to contribute to the work effort without the danger of junior staff implementing changes that go live unchecked. The ability to define user groups for the administration functions in the IP address manager is another useful tool to limit the potential damage that could result from unfettered access to the whole system by all of the team. Additions and alterations to the network can be made a lot simpler thanks to the BlueCat network templates. Templates present the administrator with a series of information layouts that ensure essential tasks cannot be overlooked and that all important data gets entered into the system. Overall, the BlueCat method tries to automate as many network administration tasks as possible in an effort to remove the problems caused by human error. The BlueCat system is best suited to large enterprises that operate a network administration team. Its group operation functions are a godsend in large systems, but may seem a little restrictive to the lone network manager operating a single-office service. The OpUtils IPAM by ManageEngine integrates DHCP and DNS functions, which makes it a DDI suite. The DHCP section of the IP address Manager can only communicate with Microsoft DHCP servers. The IPAM has a subnet discovery facility, which will greatly assist you in managing address scopes in your DHCP module to reserve ranges of addresses for each subnet. If you have a small network with only one subnet, then you can use the free version of OpUtils IPAM. The IP address Manager assists DHCP allocations by checking on the usage of allocated addresses. If polling messages sent out to an IP address receive no response, that address is returned to the pool of available addresses for distribution by DHCP. The Scope Monitor function of the IPAM gathers reports from DHCP servers on the number of allocated addresses. The monitor then checks the network for the number of those addresses that respond. If the two figures do not match up, the monitor sends an alert to the DHCP server and checks which of the allocated IP addresses are no longer in use. The IP Address Manager can communicate with devices by MAC address in case there is a failure in the IP address allocation process. This situation generates an alert that provokes the DHCP server to allocate an address and update its records. OpUtils IP Address Manager integrates with Microsoft DHCP Server 2003, Microsoft DHCP Server 2008, and Microsoft DHCP Server 2012. Scanning can be performed on demand or can be scheduled to run periodically. Each schedule produces a report that can be generated into a range of formats, including PDF. The Infoblox DDI system is another option for large enterprises. It was designed with administrator teams in mind and its pricing is high-end, so this wouldn’t be suitable for managing a small or mid-sized network. As with most of the options on this list, the Infoblox offering combines IPAM with DHCP and DNS management. The package includes templates to automate routine network addressing tasks and also comes with standard reports for management communication. Both network templates and reporting can be customized. Infoblox integrates automatic device discovery to make the expansion of networks easier. A method of DHCP fingerprinting enables the central network manager to query properties of each new device and better allocate is at as a resource. 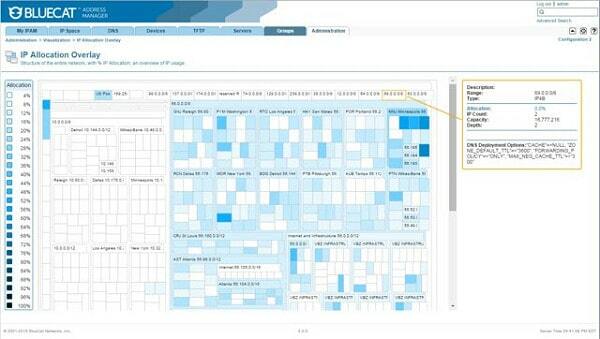 The IP resource tracking uses a system of metadata tagging to allow you to track the usage of key resources. New nodes can be integrated into the network centrally through the DDI user interface and comparison of usage for each node is also made easier by effective MAC address records as well as IP tracking. The tracking functions of the IPAM help you manage your DHCP usage more effectively. This has benefits for system security because it includes the ability to identify out-of-scope addresses on the system and isolate rogue devices. The Infoblox multi-site view enables you to treat cloud services as integrated points on the network as well as centralizing administration for dispersed corporate networks. 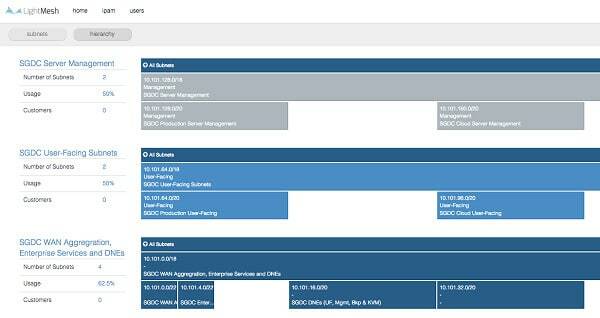 The DHCP sections of the management console make it easy to define scopes for subnets, reserved IP, and exclusions. This is a very comprehensive DHCP solution for companies that integrate disparate networks with differing topologies into one centrally-managed corporate network. Morpheus is an entire network management solution, not just a DHCP system or an IP address manager. 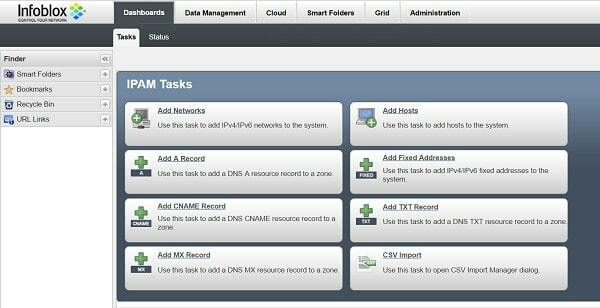 DDI functions are integrated into the Morpheus software and can be accessed from the central network manager console. Morpheus is a cloud-based solution so you can access the dashboard through a browser on any device. The system includes the management of both IPv4 and IPv6 address and enables virtual routing and forwarding. The IPAM tracks IP address usage and ties the discovered results up to the current DHCP status of allocated and available addresses. The scan logs irregularities, such as devices on the network using non-allocated addresses and non-responding addresses. This information alerts network managers to irregularities such as network intrusion and also abandoned addresses. The detection of rogue addresses tightens up network security, and logging of all events and discoveries helps track irregular activity. Alerts that discover dead addresses on the network helps the DHCP server keep an accurate record of allocated and available addresses. If you already have the Infoblox or BlueCat IPAM, you can integrate this into your overall Morpheus network management system and continue with that interface on your DHCP servers. GestioIP for small businesses. Although the OpUtils system is free for single subnets, it can be a little feature-rich for small networks. GestióIP is free and it is a much simpler system than the others on our list, making it a credible alternative for a single network manager to get to grips with. The browser-based reporting console features a straightforward list of active IP addresses. That list is searchable and you can apply filters, which makes it simple to zoom in on specific devices or network segments. A powerful network discovery tool populates the screen, helping you match active addresses with allocation records from your DHCP server. The console includes a subnet calculator, available on the GestióIP website. It also has an IPv6 address plan builder — GestióIP can manage both IPv4 and IPv6 address pools. Although the standard package of GestióIP is free, there are a couple of add-ons that you can opt for and you have to pay for those. These two add-ons include an application programmer interface, which is probably not all interesting for network managers. However, those who want to integrate information from GestióIP into other apps might be interested in this feature. The other paid add-on is a backup manager that will store the configurations of your network devices. The GestióIP interface is available in English, Portuguese, Catalan, Chinese (traditional and modern), Dutch, French, German, Italian, and Russian. 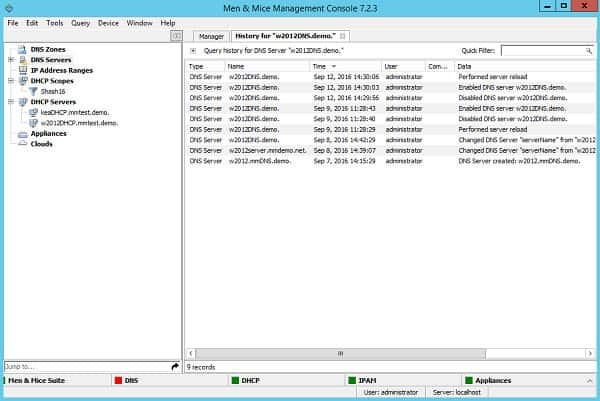 The Men and Mice DDI suite gives you DNS and DHCP management along with IP address management. If you don’t want the whole suite, you can just buy the DHCP Manager module as a stand-alone application for your network. The Men and Mice DHCP Manager is designed to cater to large networks with many subnets. The software won’t distribute the IP addresses — that function is carried out by another device on your network. Men and Mice DHCP manager can interact with ISC DHCP servers, Windows DHCP, Cisco IOS DHCP, and Kea DHCP. You can also set up Men & Mice virtual DHCP appliances. The DHCP Manager is implemented as a software overlay. You won’t need to buy an extra piece of equipment to run this service in-house. All the reporting functions are displayed on a management console accessed through a web browser. The features of the management console can be customized to show different information and grant varying levels of access control to user groups. You can instruct a reporting user group to give upstream managers access to information while reserving the controls on the console to the network administrator. A scripting capability built into the DHCP Manager enables network managers to automate processes. The scripting languages supported by the system are SOAP, RESTful, and JSON (with Python). Some standard tasks can be assisted by pre-written automation scripts, called “wizards.” An example of this is the Scope Migration Wizard, which will assist you in moving address ranges from one DHCP server to another. The Men and Mice DDI suite and DHCP Manager are suitable for large businesses that employ a team to support their networks. Smaller enterprises may find this software a little on the pricey side for their needs. 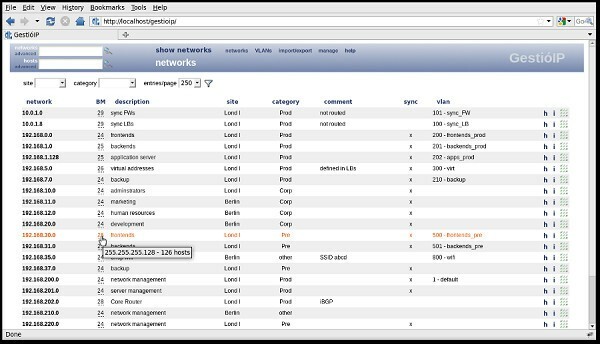 The LightMesh IP Address Manager interface is straightforward and easy to use. It includes a graphic display of the network topology, making subnets easy to organize. From the network map, you can zoom in on subnets, individual address, and get a status report on the device using that address. You can launch network scans on demand or via a schedule and that will enable you to see which allocated IP addresses are no longer active and whether unauthorized devices are connected to the network. The LightMesh IPAM is not a substitute for your DHCP servers. Instead, it communicates with all of your servers and collates current address statuses, giving you a central point from which to manage all of your address allocation servers. The system also coordinates with DNS servers. You can define user roles and grant partial access to the IPAM information to each group. This will enable you to give reporting access to management and access to monitoring screens, but not commands to junior staff. The LightMesh system includes a REST-based scripting language that will enable you to write your own automation scripts and also access IPAM data from other applications. This DDI system is priced on a monthly license. An example price is $200 per month for a 2 user license, managing 10,000 IP addresses. The LightMesh IP Address Manager is suitable for small to mid-sized enterprises. The VitalQIP package has recently been rebranded from Alcatel-Lucent to Nokia. This software suite for IP address management is also available as an appliance-based version. This is a full DDI solution with an IP address manager, a DNS system and a DHCP implementation. VitalQIP can handle both IPv4 and IPv6 addresses and it integrates its own Nokia DNS and DHCP servers, so you don’t need to get in servers from other DHCP providers. This is a high-end solution that incorporates very fast DHCP and DNS referencing. The system is suitable for internet service providers, so you should probably only consider this option if you have a very large network. The DDI has a portal to interface with cloud services, BYOD equipment, and self-service products. For customized procedures and reports, you can use the integrated SOAP/XML APIs and RESTful APIs, and the DDI comes with a comprehensive command structure. The DHCP and IPAM modules work together to monitor IP address usage, identifying unauthorized access and dead IP allocations. You can add on Nokia support to your purchase, and the company offers training courses on how to get the best out of the DDI system. This is a very comprehensive package and it can allocate and monitor millions of IP addresses in a network. The UK’s BT offers outsourced network management services all over the world, not just in its own country. This option would be a great choice for a start up because you only need to pay for the capacity of services that you use and can scale the service easily with the growth in your business. The system includes facilities that make IP address allocation a lot simpler. For example, the system works out the IP ranges needed or each subnet so you don’t have to worry about under- or over-allocating addresses in each area of your network. The Diamond IP package is a DDI suite that integrates DNS and DHCP functions. All addressing issues flow through automatically to the DHCP and DNS servers from the changes that you make in the DDI interface. Network discovery sweeps confirm the allocation of IP addresses and highlight dropped usage to enable you to reclaim addresses in your scopes. These system monitoring checks also allow you to spot unauthorized devices connecting to your network. The DDI suite doesn’t limit your DHCP server choice to Microsoft. The Diamond IP system also integrates with stock ISC/BIND, and Cisco CNR servers. The command structure of the interface can be partitioned to allow different levels of seniority appropriate levels of access to the system. This enables senior networking staff to delegate straightforward tasks to juniors without worrying that an inexperienced member could damage the system by accessing controls that they don’t understand. BT Diamond IP doesn’t just come as a managed IP service. You can also opt for an appliance-based DDI for installation on your own network if you already have a network management team and want to keep things that way. DHCP is an industry standard for IP address distribution. The complexities of hybrid systems cover a range of sites and virtual services. The need for an automated system to keep track of all your network addressing has become critical. A DHCP solution for your network will keep your subnet address scopes from clashing and make more efficient use of your IP address pool. You can also use a DHCP system together with an IPAM to keep track of the addresses accessing the network, which gives you better control over the integrity and security of the system. A DDI suite with DHCP will prevent mistakes from happening and make the network manager the star of the company. The best way to get on top of the DHCP issue and work out how it will help you manage your network better is to arm yourself with knowledge. 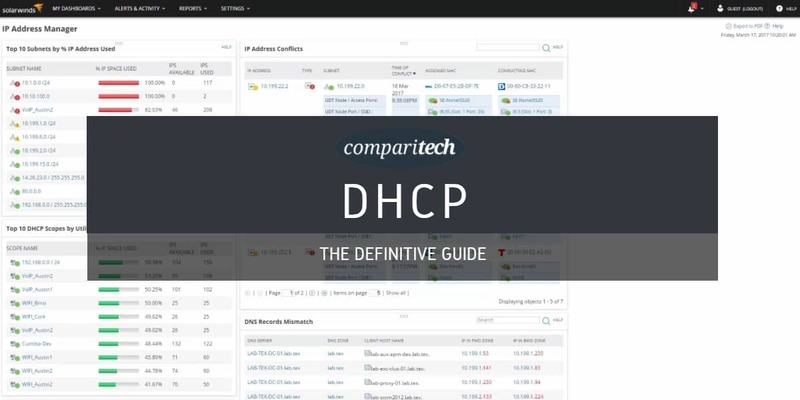 Here are some resources that will help you assess the DHCP topic. Microsoft TechNet: What Is DHCP? Infoblox: What is a DHCP Server?